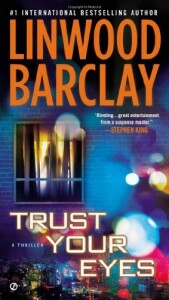 Trust Your Eyes is a standalone novel by author Linwood Barclay. Thomas spends all day on his computer looking at online maps and memorizing the layout of cities believing that he is working for the Bill Clinton and the CIA and that when all maps disappear his work will be needed. One day he accidentally stumbles upon what appears be murder that has been recorded and thrusts him and his brother into the middle of a conspiracy that will threaten their lives. This novel has a great story line in what is essentially a modern update of the 'rear window' type plot.